teammate Sean Askay and I traveled from the Ecuadorian Andes all the way to the Amazon basin with a group of journalists who report on environmental issues impacting the Amazon region. We were there at the invitation of Internews’ Earth Journalism Network to train journalists on how to incorporate compelling geographic visualizations into their stories using Google’s mapping tools. Over 20 journalists and communications specialists were represented among the newly-formed Pan-Amazonia journalist network from Amazon region countries, including Venezuela, Colombia, Ecuador, Peru, Bolivia and Brazil. As with many a fabled Amazonian adventure, we were met with exciting challenges and adventures along the way. The first began on our bus ride through Ecuador to the Amazon - we ended up relying more on Sean’s tracking our GPS location in Google Earth to navigate to our Napo River pick-up point than on our bus driver’s directions. There were a few times that the bus driver was ready to turn around and go back, but thanks to Sean and Google Earth, we all got there in the end. Once in the jungle, we stepped over the tarantulas and poison dart frogs to make it to our outdoor classroom at Yachana Lodge and face our next challenge: the slow internet connection. Luckily, with a Google Earth Portable Server we were able to serve satellite imagery, terrain, and vector data locally from our laptop to give the journalists easy access to Google Earth. It was one of our first trial runs with this tool, which will be very useful for future trainings and to other organizations - for example, in crisis response situations where people want to operate a full Google Earth environment despite low internet bandwidth. 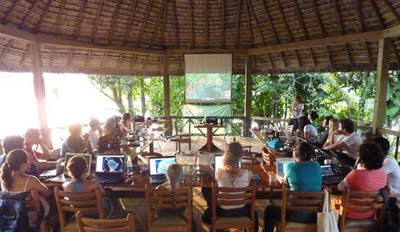 Training in our “classroom” in the Amazon on the Napo River, Ecuador. During the training we focused on developing the journalists’ skills in using Google Earth and Google Maps as research tools and for news content creation. They learned how to create quick and easy geographic visualizations to embed in a webpage with Google Maps or Google Fusion Tables, to sync photos taken in the field with GPS tracks, and to record tours in Google Earth for movie-making. With environmental threats to the Amazon coming from so many different sources, using these online mapping tools allows these journalists to cover the whole region and illustrate their stories in a visual way that’s easier for the public and policy-makers to understand. Answering Google Earth questions during a hands-on activity with journalists. 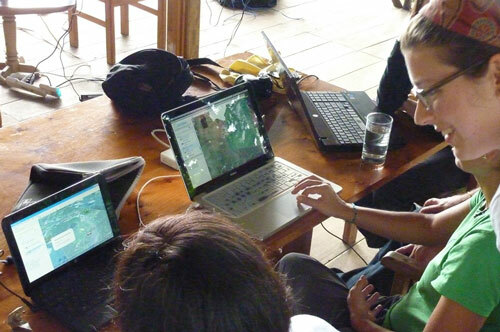 Internew’s Earth Journalism Network and Amazonian journalists plan to use these new tools and techniques to bring the story of the Amazon to the public. James Fahn, the executive director of Earth Journalism Network, attended the training and saw many possibilities for collaboration and use of Google mapping and visualization tools for journalists covering environmental issues around the world. If this pilot project is successful, Internews hopes to bring the training to journalism networks in other countries. 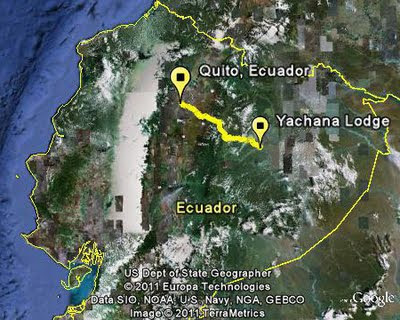 In July, my Google Earth Outreach teammate Sean Askay and I traveled from the Ecuadorian Andes all the way to the Amazon basin with a group of journalists who report on environmental issues impacting the Amazon region.